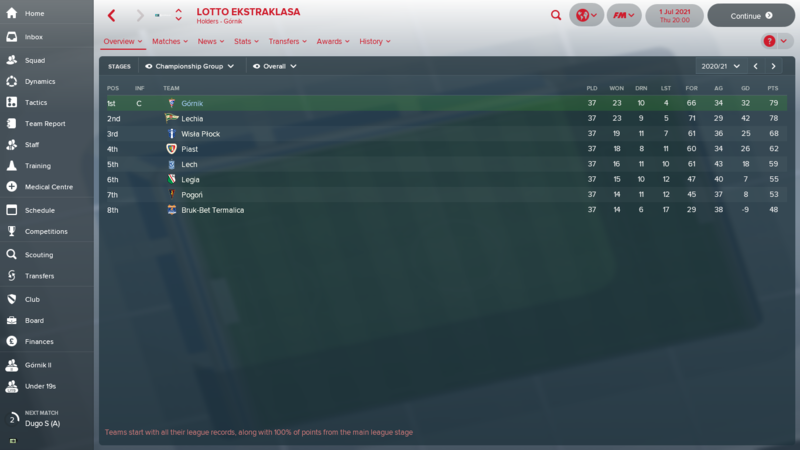 So after finishing second in the league last time out I decided to set myself a near impossible task for this season, I wanted to win LOTTO Ekstraklasa and with us being priced as 7th favourites at 39-1 I knew that this was going to be a long, hard season. Next is one competition I am not too concerned about and that is the Polish FA Cup. I will be playing a rotated side for the entirety of the competition but it would certainly be nice get past the Second round – this is something we could not manage last season. In terms of the Europa League my aim was to once again to simply qualify for the Group Stage. I knew that this would be unimaginably hard to achieve as last season we only managed to squeeze past FC Twente on the away goals rule, however if we did achieve this goal and qualify I was not planning on making it through our group! 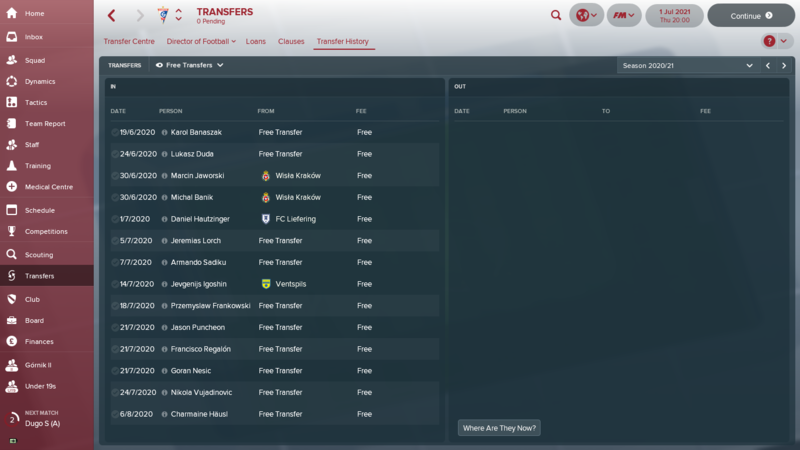 Now to the transfers, as you know if you have been reading the previous parts we have been in some financial difficulty lately, especially last season when I was not able to bring any additional players into the club. However this year was the time for change, this is because of the money we received from the Europa League last season and on a sadder note some sales that we have made this season. Gornik Zabrze | Decent profit!! I will get the outgoing transfers out of the way first, unfortunately our star man Marek Antkowiak has left the club for £2.6 million after his was release clause was met by Arsenal. Antkowiak’s time at The Gunners has been bitter sweet this season – during his first appearance in the Premier League he broke his ribs which has him sidelined for three months. Next up was our defensive midfielder Radoslaw Fryczkowski whose £2.5 Million release clause was met by another Premier League club, this time in the form of Manchester United. To be honest I am slightly disappointed in Fryczkowski as he has now chosen to join our title rivals Legia Warszawa on loan for the season. One way of bringing in players to the club is through the now famous Gornik Zabrze regen days in which we seem to find some unbelievably talented Polish youngsters. You’ll be excited to know that this year was no different! In my opinion the pick of the bunch was winger Adam Klos who was moved straight into the first team. In fact, Klos became not only Gornik Zabrze’s youngest ever goalscorer but the LOTTO Ekstraklasa’s too. This was after he netted against Pogon at the age of just 15 years and 309 days old, this kid certainly has a bright future ahead of him! Now to the exciting part, the incomings! I may have gone a bit signing crazy this year as you can see below but I will just mention of few of my favourite signings as otherwise we will be here all day. First up is Montenegrin centre back Nikola Vujadinovic, he will slot nicely into out first team alongside Mateusz Wieteska and with him being paid £2.5k a week I expect him to perform at the highest level. Secondly came Albanian striker Armando Sadiku who arrived on a free transfer from Legia Warszawa. He is being paid £9k a week which is a huge three times more than our second highest paid player! I just couldn’t resist myself with this transfer as I was already in the market for an additional forward after veteran Igor Angulo retired at the end of last season and by looking at Sadiku’s stats I expect the 29 year old to have a massive impact at Gornik Zabrze. Lastly on the incomings is a bit of a strange transfer, this comes in the form of English attacking midfielder Jason Puncheon, yes you read that correctly Jason Puncheon! After his contract expired at Wolves he was a free agent and was also interested in a move to the LOTTO Ekstraklasa so I decided to offer him a contract which he gladly accepted. His main role within the side will be to tutor some of the youngsters and also be a back up to Szymon Zurkowski in the advanced playmaker role this season. I will start with the competition which I believe that we performed the best in this season, the LOTTO Ekstraklasa. Even though I have achieved this I cannot quite believe it myself, we have won the league in dramatic fashion on the final day of the season. On the final day we leapfrogged Lechia and clinched the title by a single point after we beat Wisła Płock at home and Lechia failed to beat Piast Gliwice. 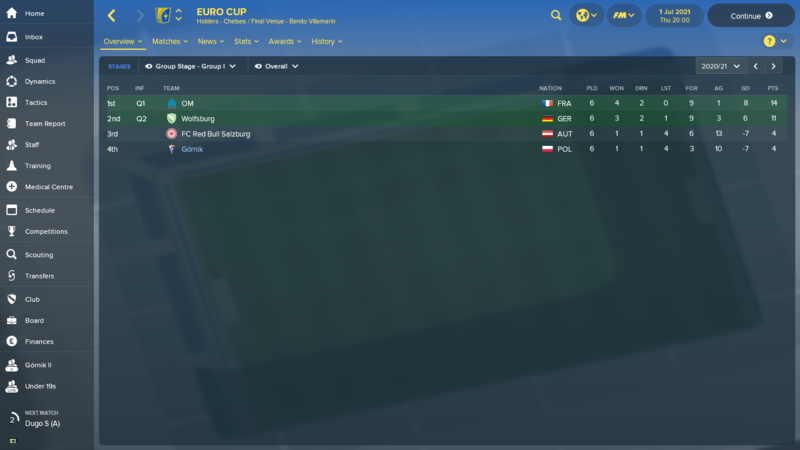 I am extremely proud of this achievement as it is the first time Gornik Zabrze have won the title since 1988 and I never thought that I would be able to win the title relying on free transfers and youth prospects! 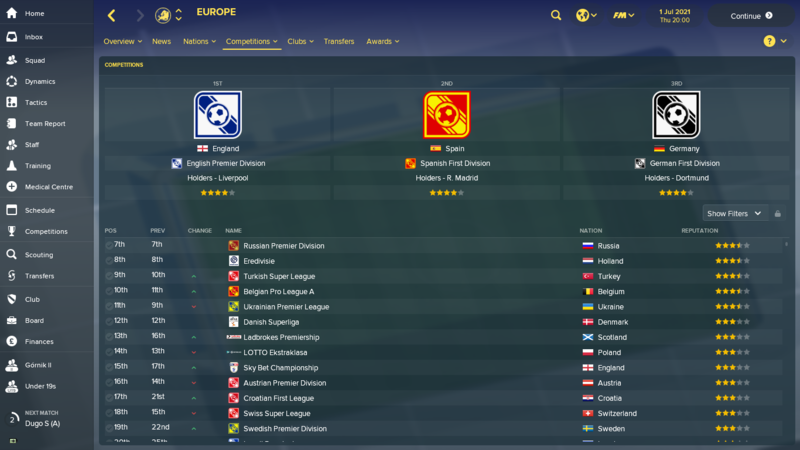 In terms of the Europa League we once again managed to qualify for the groups. In the second qualifying round we played a Norwegian club, this time in the form of Vålerenga who we comfortably beat 3-0 on aggregate. Next up came an impossible task, we had to somehow find a way past French club OGC Nice. Incredibly we managed to do this scoring six goals in comparison to Nice’s three! Lastly, came a slightly easier draw in Irish side Dundalk who we comfortably brushed aside 2-0 at home and 1-0 at Oriel Park. We were then drawn in Group I alongside Austria’s Red Bull Salzburg, French giants Olympique de Marseille and finally to complete the ‘group of death’ came the German side Wolfsburg. To be honest with you I knew that there was no way that we were going to qualify from this group but I did not imagine that we would finish rock bottom only picking up four pints in total! These came from a draw away against Salzburg and a shock home win against Wolfsburg with our main man Armando Sadiku leading us to glory. In the end we only scored three goals whilst conceding ten, not the best performance at all! For the second time in four years we managed to win the Polish FA Cup! If was a hard road to the final especially in the semis when we barely squeezed past Lechia on away goals. In the final we played Legia Warsawa and an unbelievable performance once again from Armando Sadiku against his old club secured us a famous win. As you can imagine with us doing the double this season there were a fair few achievements to go through, so lets get into it! First all of, our 23 league wins this season is a record for Gornik Zabrze. I believe that this in turn led to us gaining an average attendance of around 24.000 this season which is not only a record for us but also for the LOTTO Ekstraklasa. As you would expect because of our league win the LOTTO Ekstraklasa team of the season was dominated by our players, this included full back Perger, centre defensive partnership Wieteska and Vujadinovic, midfield general Kurzawa and our Albanian beast Sadiku. Speaking of our Albanian beast, he finished the season on 28 goals which is the most goals scored in a season by a Gornik Zabrze player ever! No wonder he was voted our signing of the season. Dariusz Pach also had a fantastic season for us gaining a huge 50% of the votes for our player of the season, his 13 assists set a new record for the club and even earned him a call up to the Polish national side. However, with the likes of Liverpool and Spurs keeping a close eye on Pach it will certainly be hard to keep him at Gornik Zabrze next season. Now to possibly the most important award, the LOTTO Ekstraklasa manager of the season. Could I possibly win this award again? Yes, of course I could! It was never in doubt really, but I couldn’t have done this without my fantastic side who out performed all expectations for the season and silenced all the people that doubted us. Finally, as usual we check if we have improved the reputation of the LOTTO Ekstraklasa and see if it has moved up in the competition reputation rankings. Well to my surprise it has actually dropped down one to 14th place, I can only assume that this is because we have won the title and it is not one of the major clubs such as Lech Poznan or Legia Warsawa. So that’s it for Part 4 of my Rebuilding Gornik Zabrze save in the 2020/21 season. I hope that you enjoyed my blog and if you have any suggestions either for transfers or even how to improve this blog please either comment below to head over to my Twitter @Casual_FM_ . Once again thank you for taking the time to read this blog! This entry was posted in FM18 Stories, Football Manager 2018, Gornik Zabrze | @CasualFM and tagged europa league, europe, fm stories, fm18, football manager, Gornik Zabrze | @CasualFM, poland, polish ekstraklasa. Bookmark the permalink.